With more than 25 years of experience in Hydraulics, Sant Engineering Company is known as one of the leading manufacturers and suppliers of hydraulic power packs in India. Our company provides standard as well as custom – built hydraulic power packs. 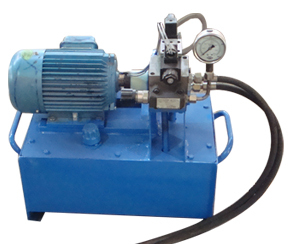 Hydraulic power pack consists of oil tank, whose base frame carries a vertical or horizontal flange mounted, electrical motor couple through a gear coupling to vane pump, gear pump or a piston pump, depend on pressure and capacity. Minutest detail ensures that only standard accessories such as suction strainers, breather, pressure gauge, gauge isolators and return line fillers, etc are to be used during the manufacturing process. All the products are made with additional care to maintain international quality standards in the final product. Intense care is taken to ensure that Quality Standards are maintained throughout the manufacturing process. Our company use high quality pumps and valves of world-renowned brands like BOSCH-REXROTH VICKERS, YUKEN, AUTOS, SUFFON, POLYHYDRON, HYDROLINE and STUFF from India and worldwide companies etc to guarantee excellent performance.